— Astronauts Sally Ride and Mae Jemison, along with three other noted women from NASA's history, may be soon made into official LEGO minifigures now that a fan's proposal has qualified for a production review. 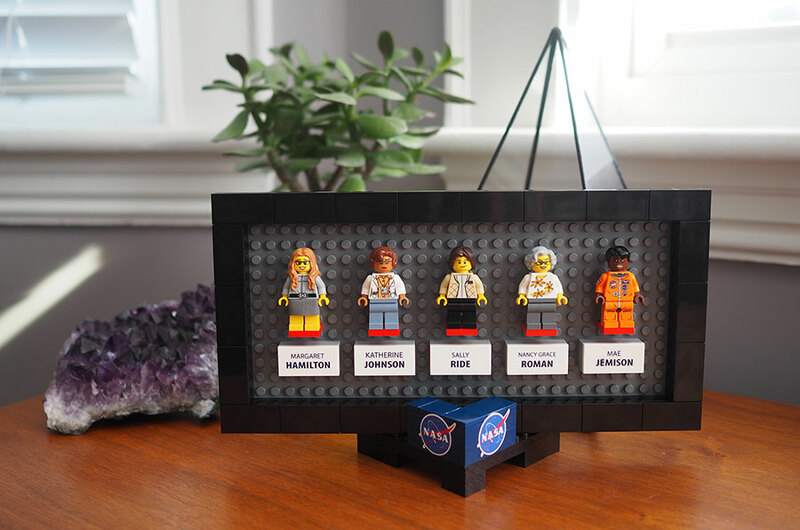 The "Women of NASA" set, which was created by science writer Maia Weinstock, soared to 10,000 votes on Tuesday (Aug. 2) on the LEGO Ideas website, where the public can support fan-made projects in hopes of seeing them offered for sale by the Danish toy company. Projects that meet the 10,000-vote threshold are considered by LEGO to possibly become official products. "Thanks again to all who have supported, cheered, and shouted from the rooftops on behalf of 'Women of NASA'!" Weinstock, deputy editor at MIT News, wrote on the LEGO Ideas site after the set surpassed 9,000 votes on Monday. "It will be a dream come true if we can get this to LEGO Review, and potentially to stores around the world." In addition to space shuttle astronauts Sally Ride and Mae Jemison — the first American woman and the first African-American woman in space, respectively — Weinstock's set includes a NASA computer scientist, a mathematician and an astronomer. Margaret Hamilton led development of the on board flight software for the Apollo moon missions. Katherine Johnson was a "human computer" who calculated the trajectories of NASA's earliest spaceflights through to the moon landings. And Nancy Grace Roman helped plan the Hubble Space Telescope, as well as developed the astronomy research program at NASA. "While this project features five individuals, the spirit of the Women of NASA set is meant to honor all women who've contributed in some way to the [space] agency's mission of advancing society through space exploration," commented Weinstock. 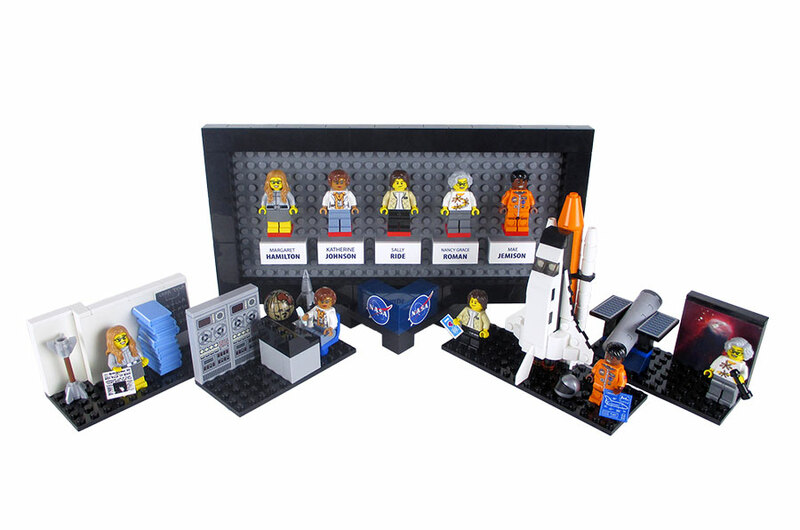 The set accompanies the 1.5-inch-tall (4 cm) figures with a desktop display frame and four toy brick-built vignettes: a miniature model of the Hubble; a miniature space shuttle; a diorama of Hamilton's stacked computer code; and the mathematical instruments of the Apollo era. 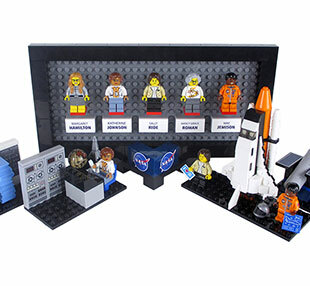 The "Women of NASA" set received its 10,000th vote just two weeks after it was first posted to LEGO Ideas on July 18. The project was shared on social media by NASA and the United Nations, as well as was widely covered by the press, including articles by Popular Science and The New York Times. The set also attracted the attention of the cast and crew working on the 2017 feature film "Hidden Figures," which focuses on Katherine Johnson and the African-American women who worked for the early U.S. space program. "Please support Katherine Johnson and Women of NASA get their LEGO set!" recording artist and actress Janelle Monáe, who portrays mathematician Mary Jackson in the Fox 2000 movie, wrote on Twitter. 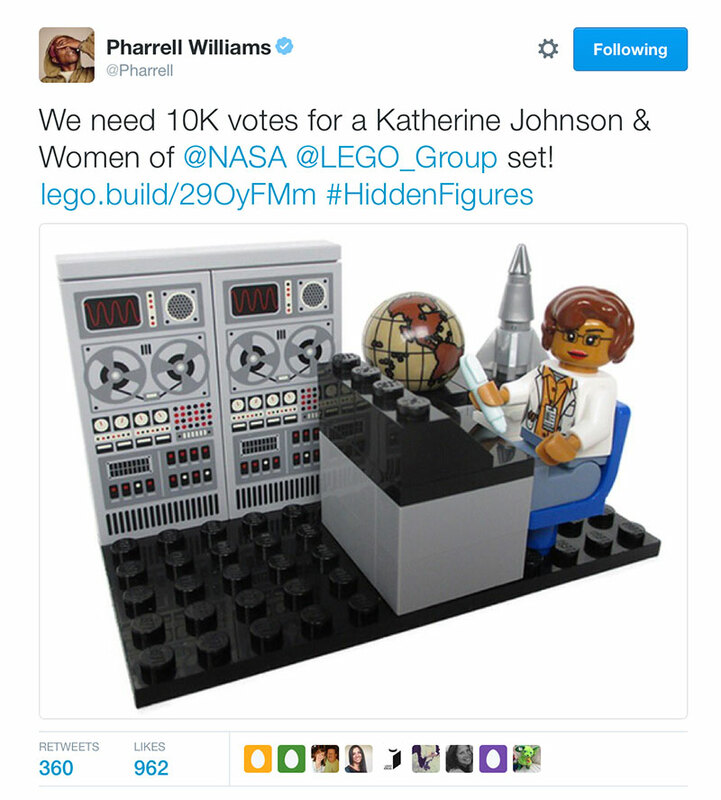 "We need 10K votes for a Katherine Johnson and Women of NASA LEGO set!" tweeted singer Pharrell Williams, who is producing and contributing music to "Hidden Figures." LEGO evaluates all projects that qualify for review in three annual batches. The next review begins in September and will take several months to complete. The review's results are expected to be announced in January. LEGO Ideas has produced three space-themed sets since 2008, including a model of Japan's asteroid sample return probe Hayabusa and NASA's Curiosity Mars rover. Earlier this year, LEGO approved the production of a fan-created model of the Saturn V rocket that launched the Apollo 11 mission to land the first astronauts on the moon. 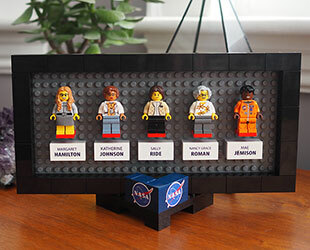 See the Women of NASA set on the LEGO Ideas website.